BBC NEWS | Business | What now for Fiat? Within minutes of the news that Gianni Agnelli had died, shares in Fiat - the company he had presided over for more than 30 years - were up more than 5%. Mr Agnelli may have been credited by business leaders and politicians for turning the carmaker into one of the world's industrial leaders, Italy's biggest employer and a national icon. But his patriarch status was being increasingly viewed as a handicap to the debt-laden group's future. Fiat's heyday has been replaced with a mounting list of creditors and sweeping job cuts and while analysts and investors have called for radical change, Mr Agnelli clung to the idea of national heritage and insisted it should remain in Italian hands. Analysts say now he is gone, the playing field is much wider. "His death means we have a completely different situation," said a car sector analyst in Germany. "It is now an open question what will happen to Fiat Auto because he was perceived as the man wanting to hold on to it." It is the Fiat Auto division, which makes the Lancia, Alfa Romeo and Fiat brands, that has proved the group's biggest liability. Sales in the division have dwindled and Fiat admitted in November that debts in the Auto business could reach as much as 2bn euros ($2.1bn;�1.3bn) for 2002. The company as a whole is submerged under debt of almost 3bn euros ($3.1bn;�2bn) and has been forced to lay off 8,100 workers and sell of a series of assets. However, the angry protests that met the job cuts came from employees, not investors. 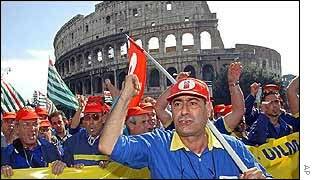 For Italian workers, it seems incredible that the company which once represented employment security and - albeit faded - national pride, should succumb to market pressures and end its glory days. Even more unthinkable was the suggestion that the company should end up in foreign hands. In 1996, Fiat swapped 20% of Fiat Auto for a 6% stake in the US giant General Motors (GM). It now has the option of forcing GM to buy the rest of Fiat from 2004 onwards. Mr Agnelli headed the crusade against foreign ownership and a meeting of the Agnelli family - which still owns almost 34% of Fiat - was scheduled for Friday, the day of his death, to discuss their stance. There have already been suggestions the Italian entrepreneurs Emilio Gnutti and Roberto Colaninno could step in with benevolent cash in return for places on the board. Meanwhile Fiat said earlier this week that it was considering splitting into two separately listed companies and looking at various possibilities to refinance its auto business. The Italian prime minister Silvio Berlusconi has even joined the movement to maintain Fiat's national heritage and suggested in December that the Italian government would step in to help the ailing group. The question is whether Mr Agnelli's death will weaken the Agnelli family resolve to hang on to the business or speed up a potential sale. There are already persistent rumours of splits within the family, and both Gianni and his brother Umberto are without male heirs to inherit the legacy after their sons died early. Umberto Agnelli is close to retirement age, and there are suggestions that it would fall on Gianni's grandson, 26-year old John Elkann, to maintain the family legacy. However, Fiat is also beholden to creditors and the business community reacted cynically to Gianni Agnelli's death. "The future of the car division really rests on the management of Fiat being able to restore some degree of profitability," said Nicholas Potter, an analyst at Theodoor Gilissen Securities in London. "That doesn't change whether it be Giovanni or Umberto," he added. A number of analysts insisted Mr Agnelli's death marked the passing of a symbolic figurehead rather than heralding any real change. "Apart from the psychological and emotional effect, which is also behind the share price reaction, Agnelli's death does not really change the situation," said Giulio Brunetta, a fund manager at Alpe Adria Gestioni. "His had been ill for a long time and the family, headed by brother Umberto, has been in charge of the situation, " added Mr Brunetta. However, he conceded that progress might now be swifter on Fiat's future. "It is not only the family which will decide on the group's future, there are also creditor banks. "Now they have to decide quickly whether to undertake a long and difficult restructuring or accelerate the exit from auto sector." Analysts throughout Europe agreed that his death would spark psychological rather than physical changes. Gabriele Gambarova, an analyst at Rasbank in Milan, said: "Agnelli's death does not change Fiat's strategy - a progressive exit from the auto business which all the recent meetings between Fiat top managers, creditor banks and GM have indicated - but it may change its modality and terms."